No, it's not paint a zombie, but it's close. Actually I'm willing to bet there are any number of things you could do to improve your painting, but this would be my top recommendation. Find something different to paint. That's right, paint something you don't normally paint. Something completely different than what you're used to painting. The further away, the better I think. If all you ever painted were Space Marines, try something from the Fantasy range or better yet, a different game all together. You'll be surprised at how difficult it can be. Even if you use the same colors you normally do. Just the different model, textures, scale and such will throw your game off. You'll find yourself focusing on things you normally take for granted. You'll hit bumps in the road where it's normally smooth sailing. All of these things will help you get better. You might find a new technique or trick you never knew before because you've had to improvise this time around. You might find a new color combination or method for applying paint you never tried before. All things that will improve your work when you head back to the normal stuff. I've painted a few models, meaning I can count them all on one hand, that were "different" from what I normally do. And I learned something from every one of them. If you don't have the ability to go out and buy something different to paint, you can try pushing yourself to try something you haven't done before. While it may not be as big of a leap, it will still help you out with your painting overall. Never done a quartered Space Marine scheme in contrasting colors? Give it a go on a test model. You can always strip the paint and never tell anyone you painted another chapter. Your friends don't have to know. And it doesn't have to be Golden Daemon stuff either. In fact, you don't even need to finish the model if you don't want to. Sometimes I'll paint a shoulderpad just to try something out. The point is, you need to get out of your comfort zone when it comes to painting and try something you haven't done before. 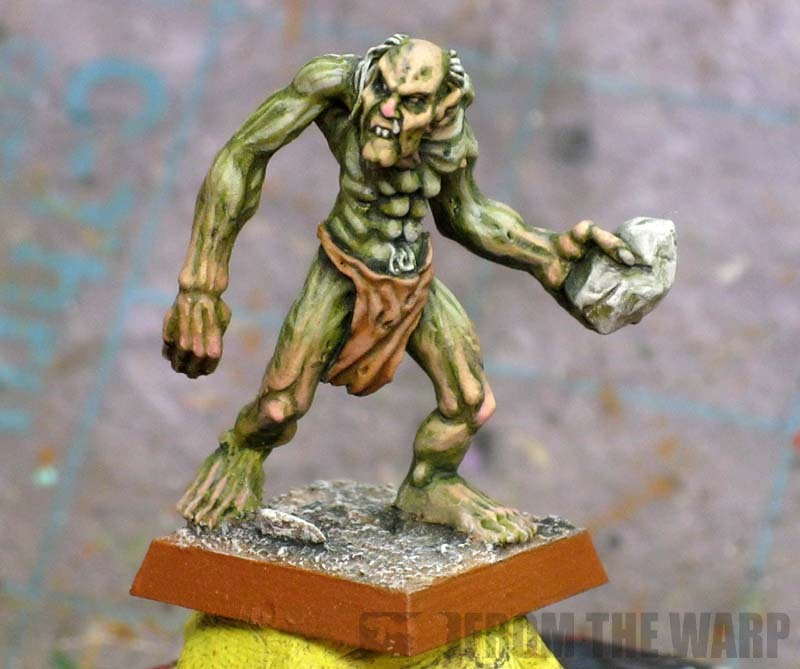 Do you love or hate to paint your models? 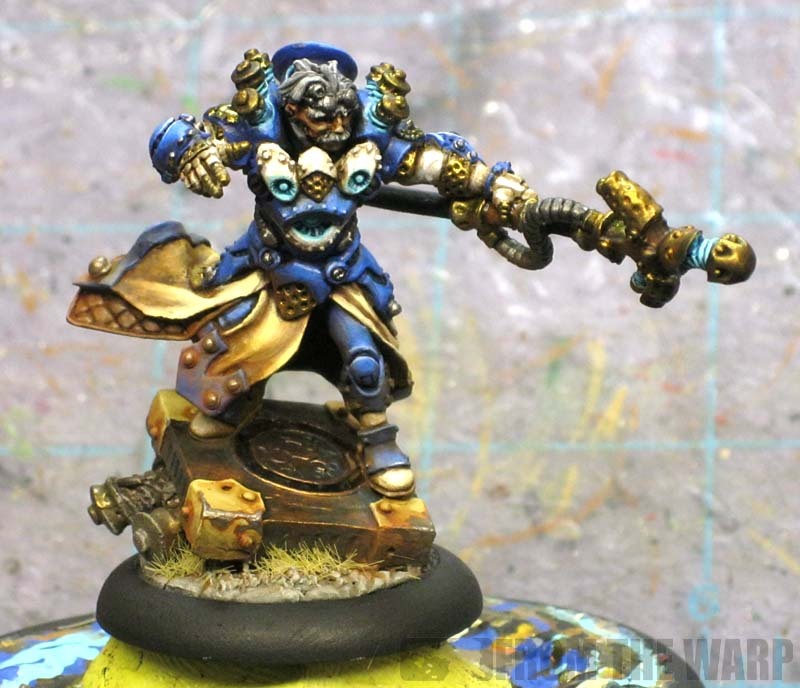 I resently got into warmachine and damned if your not right. Painting is MUCH harder these days as I basically re-learn how to paint. This is an excellent tip, it's helped my painting a lot over the years. The base on that Privateer mini is stunning, fantastic work! This is why I started a summer swap on the Infinity boards. I'm getting to paint Ariadna, which is all camo, curves, and cloth. This contrasts sharply with my ALEPH, which is all hard lines and shades of grey. It helps a lot. This is also why I play... red Space Marines, greenish Tau, grey and bone Everblight, blue Cygnar, and ALEPH. I get to paint a lot of different things. It's fun. Devil Without a Clue: That's a good way of saying it... relearning how to paint. Anonymous: Thanks. I would have never of painted the model (being that I hardly stray outside of 40k) except it was for a friend to help raise money in a charity army he was putting together. I tired to match the pictures in the book he gave me as close as I could. Zab: Excellent point that I forgot to add. Terrain can be a huge departure from painting minis and can teach you a ton about painting for effect. Mark Stone: It sounds like you've got this down to a science then. The variety that comes with painting different things can really help overall as I'm sure you know well. This is incredibly good advice! I went from Space Marines to Tyranids because I wanted to learn something else anyway game wise. Wow, did I learn a lot more, and it's made my Terminators even better for it. Washes were amazing! I experimented and started painting some Mantic ForgeFathers. They are considerably smaller then anything I've worked on and I'll be damned if it didn't reinvigorate my painting "mojo" and helped me to focus more on all the details. Changing things up every once in a while is healthy for hobbyists. It definitely helps. I have a TON of the old pewter Ghouls and they are way better then the new plastics at least to me. Keep up the awesome work and all the advice you bring to us all! One of the main bonuses of my whfb "randoms" -> warhammer quest characters plan. Although I did also try to combine different models with different colours as well. I don't frequently paint dwarves or lots of neutral colours so I definitely learned a lot from them. Good shout Ron - Also try some of the smaller company game systems (e.g. Empire of the Dead, Bushido, Freebooter's Fate, Crooked Dice), plus some of the more "boutique" (hate the word, can't think of an alternative) ranges (e.g. Raging Heroes, Heresy, Avatars of War). Also historical stuff too, where you don't have quite so much artistic licence, and are effectively recreating real life uniforms, that definitely makes you think about how you paint. I couldn't agree more. For a while I did commission work and one client routinely sent me figures from Reaper for use in D&D. I learned a ton working on those. Chioxin: I suspect jumping to Tyranids from Marines could teach you tons about different painting techniques. Kevin: Thanks and your'e right. Panting the details on smaller models or learning which ones you can skip help when you come back to your "normal" things. Tristan M: I have the subscription White Dwarf model I want to paint one day. Just for the learning experience. Andy Walker Good point, the historical stuff can be tough I suspect. The color schemes are very clear, the environments they fought in are clear... you have to match all that up. Thor: That's one of the things I enjoy about commission work... the variety. I wholeheartedly agree. My painting took a noticeable step even just with the switch from Chaos Marines to Blood & Dark Angels. Then a huge leap when I added IG to my collection, and another big jump when I started my Nids. Jumping off to the side to paint Models by Reaper and other companies for D&D Games has certainly helped, too. I'm trying to get the time and energy together to get my Khador stuff painted up, and I expect that to help out yet again. nice tip man! i like the "getting out of the confort zone" so i guess some sci -fi should b a must for me..
westrider: Doesn't it seem like you learn something new and then bring that back to your Chaos Marines later on? It's something you would have never of learned except the new model forced you into considering.trying to do it. dancing platypuss: Definitely! I can say the reverse is true for me. Painting Fantasy or non sci-fi stuff is very hard for me to do. Thanks to the new allies rules in 6th Edition, you can even paint up mini-armies and play them with your other figures. A lot of cynics complain that Games Workshop did it to sell more models (obviously), but it also gives players a chance to try their hand at small groups from different armies and to use them without having to fully commit to 1500+ points of figures. I've been strongly considering painting up a force of Ultramar Auxilia to go along with my Ultramarines. They would be my first non-marine models and would give me a chance to try out a slightly different scale. And the lack of an official paint scheme or uniform allows for a lot more creativity. James: You make a great point about Allies. I want to add a small squad of Death Korps of Kreig to my Space Marines one day. I've definitely found this helps. My painting seemed to improve quite a bit after I bought an old heroquest set off eBay and painted it up. Old board games like this are brilliant because there are a wide variety of models to paint but only a few of each type and you get a sense of achievement without painting a whole army. Cheers for the great tip Ron and I hope everything with the house is going ok. I completely agree with this. Hit a roadblock on one model or a set, you might need to move over to a small, single project. THIS. I learned more about layering, esp with flesh shading just by taking a few days to paint some Trollbloods for my wife than I ever had painting Space Wolves. Since allies were mentioned, I wanted to point out another idea (at least for 40k/Fantasy players) could be to paint up a couple Kill Teams or Mordheim warbands. Since you are usually only talking about a single unit, the model cost is low, plus because of the nature of those squad sized games, you have a bit more flexibility regarding how you build and equip them in the first place. rob82: Now there's a good idea. Pick up something old and way out of your realm for a challenge. Fayte: Even if you don't finish the model, sometimes it helps just to work on something completely different to give you a new perspective. pdelair: Excellent point about the Allies. Mordheim is a great way to try your hand a group of different models each with their own challenges when it comes to painting. Piotr Michalek: Your doing exactly what I'm talking about. Just the change of colors from Nurgle to Slaanesh can cause issues and make you rethink how you do things. I've actually finished the daemon prince so if you want, you can check out the effect. I posted a few pics on my blog (rotforge). Piotr Michalek: He looks great! I've only ever painted one Daemeon and it was a gag... but it was a blast to paint up the skin tones and not have to worry about armour plates and crisp edge highlights and such. This is bang on - not only because it's a way to learn new things but also because the renewed enthusiasm for painting a different way and different stuff can really drive you along. Anon: Glad you like it!